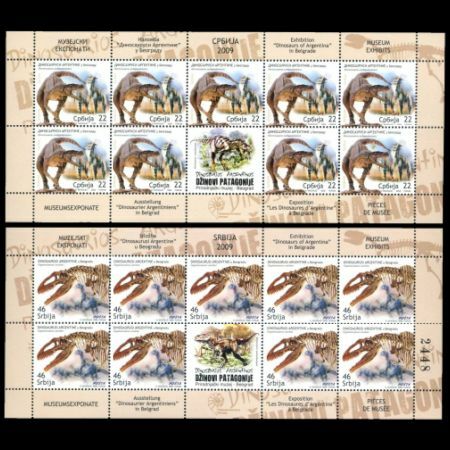 Serbia 2009 "Museum Exhibits - Dinosaurs of Argentina in Belgrade"
Layout Printed in 2 x 5 sheets with a label in the middle of the bottom row (9 stamps nad 1 tab). 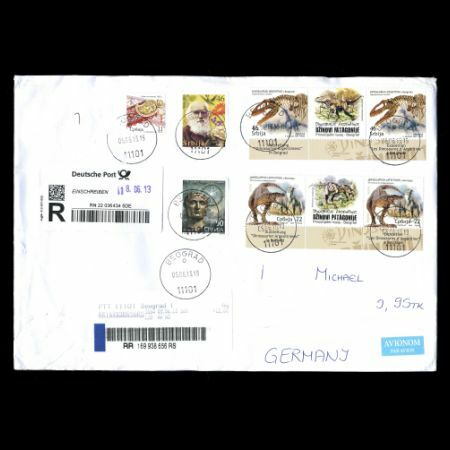 On November 11 2009, Post authority issued set of two stamps. 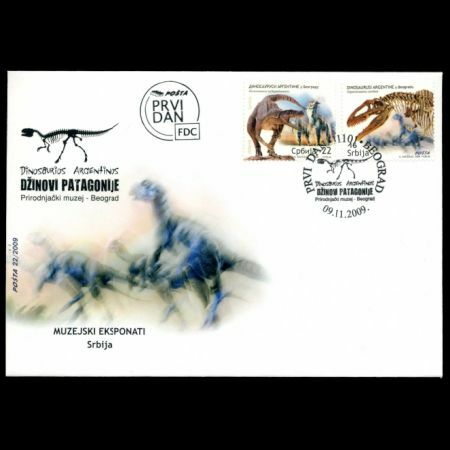 of dinosaurs: "Dinosaurs of Argentina in Belgrade". 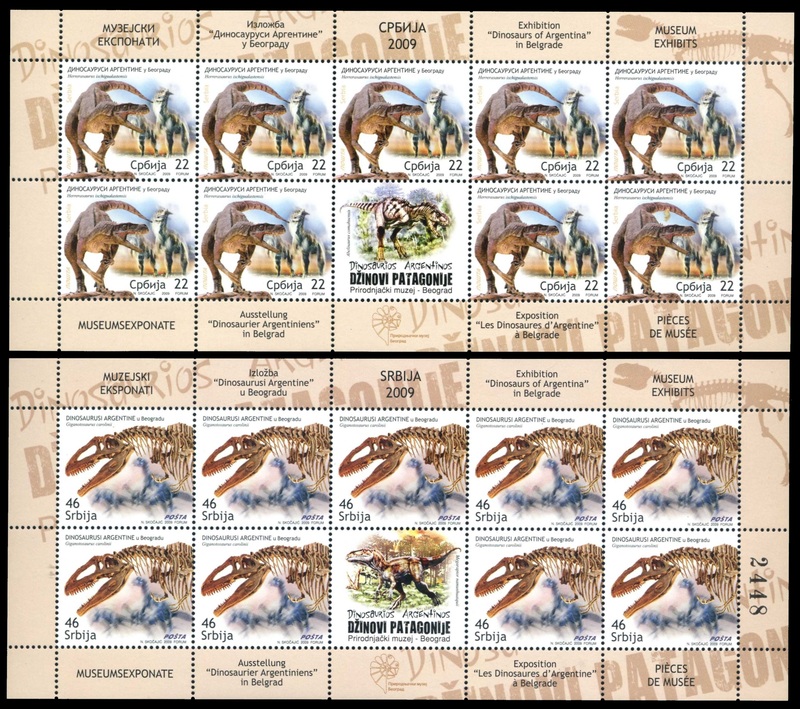 One stamp shows reconstruction of Herrerasaurus ischigualastensis another shows skeleton of Giganotosaurus carolini. 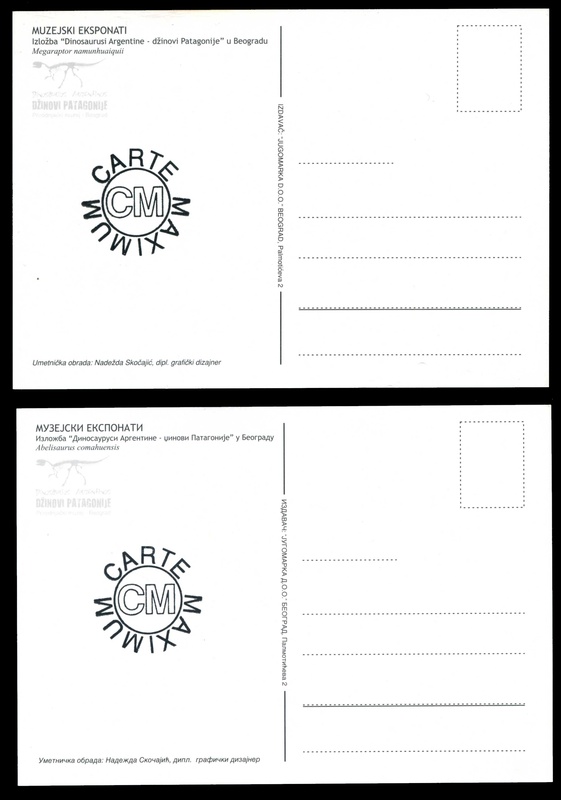 Stamps issued in mini sheets of 9 stamps and 1 tab (5x2) in the middle of thes second row. The exhibition Dinosaurs of Argentina - Giants of Patagonia was brought to Belgrade as a result of cooperation between GGPCLA Grupo Cultural from Argentina and Belgrade Natural History Museum. Dinosaurs belong to the reptile family which was extincted 65 million years ago (60 million years before the appearance of the first hominid). The word dinosaur (terrible lizard) was used for the first time in 1841 by Ser Richard Owen, the naturalist. The exhibition presents 20 species of dinosaurs and around 40 exhibits of skeletons or skeleton parts, dinosaur eggs, nests, craniums, bones, footprint replicas and reconstructions of life in the past. The exhibition's most attractive part consists of the complete skeletons of 10 dinosaurs: the bloodthirsty camivore Giganotosaurus (14 m), herbivore Rabbachisaurus (17 m), Camotaurus (7.5 m), Herrerasaurus (2,5 m) etc. The Belgrade exhibition also features a premiere: a nine-meter Megaraptor, with claws half a meter long. Dinosaurs discovered in Patagonia, southem region of Argentina, are considered to be the oldest dinosaurs that ever lived on our planet, during a period which lasted more than 180 million of years. The Natural History Museum also prepared a mini - exhibition Serbia in the time of dinosaurs which features exhibits of the world of fossils that lived in Mesozoic era, on nowadays territory of Serbia, which was, at that time, mostly under the sea. That is the reason why a big number of fossils belong to invertebrates (snails, shells, sea urchins, ammonites). There was no much data about the dinosaurs. 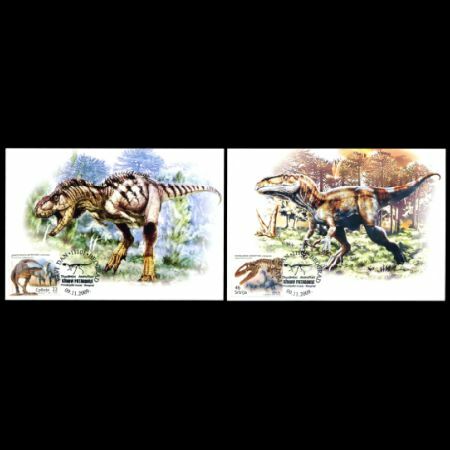 The most reliable facts were gathered on the Balkan mountain where finger replicas of very small dinosaurs (Thecodontosaurus) were found in 200 million years old rocks. 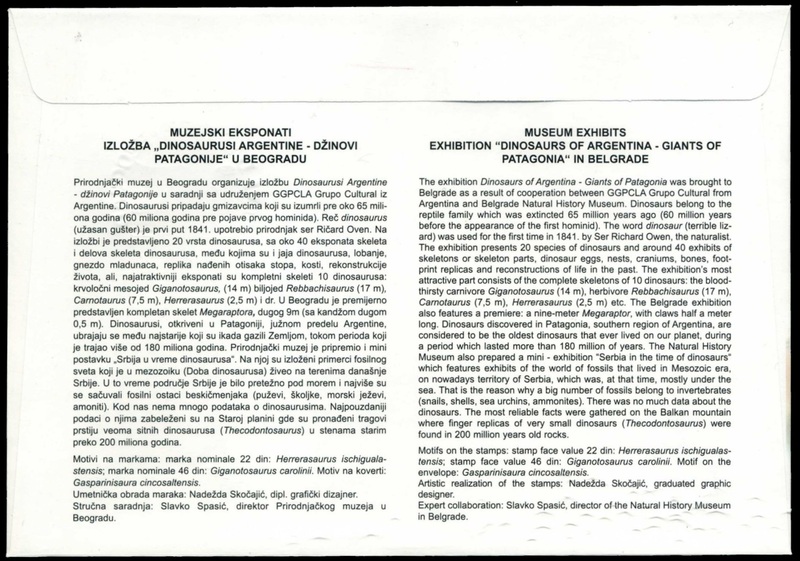 This exhibition was very significant culture event in Serbia, the newspaper SerbiaToday wrote: "Belgrade, June 23, (Serbia Today) -During the next seven months, visitors will have the opportunity to see the beautiful exhibition " Dinosaurs of Argentina -Giants of Patagonia" in the Impulse hall of the hotel "Continental" in Belgrade. ... This is chronological exhibition, which includes recapitulation life dinosaur 65 million years ago. Before Belgrade, the exhibition was in in Washington, and Turin, and was very visited. According to organizers, this is not passive exhibition, but requires the active participation of visitors. The exhibition is particularly interesting for children, there are workshops for them and competitions in drawing dinosaurs and big puzzle with dinosaur theme. Also, there are a lot of dinosaur toys that show the period in which they lived. This is educational exhibition and visitor can learn how dinosaur lived, what they hunted. It is estimated that the dinosaur life, depending on the type, was 20 to even 400 years. Visitors in Belgrade have a special honor to attend the European Premiere oldest dinosaur Megareptora nine meters long and 70 centimeters in length hand. During the exhibition, visitors will be able to see the mini-setup "Serbia at the time of dinosaur," in which will be shown to world fossil remains that at the time lived in Serbia. According to organizers from Natural History Museum of Belgrade scientists in some part of Serbia found only the remains of shellfish, sea snails and sea-urchins. However, they are hoping that there is a chance to be in Serbia found something this spectacular. 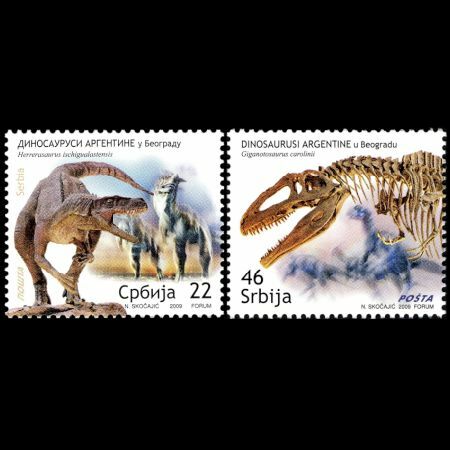 Exhibition of fossil dinosaur remains have great national significance, because it has not seen in our region and will be open until January 2010"
Acknowledgement: Many thanks to Serbian Stamps Shop for help to find an information about these stamps.